Bill and Irene (Maes) Bogh, Tahoma class Taylor class of 1939, at the Taylor program. Taylor as a company town was discussed at the reunion Oct. 17. 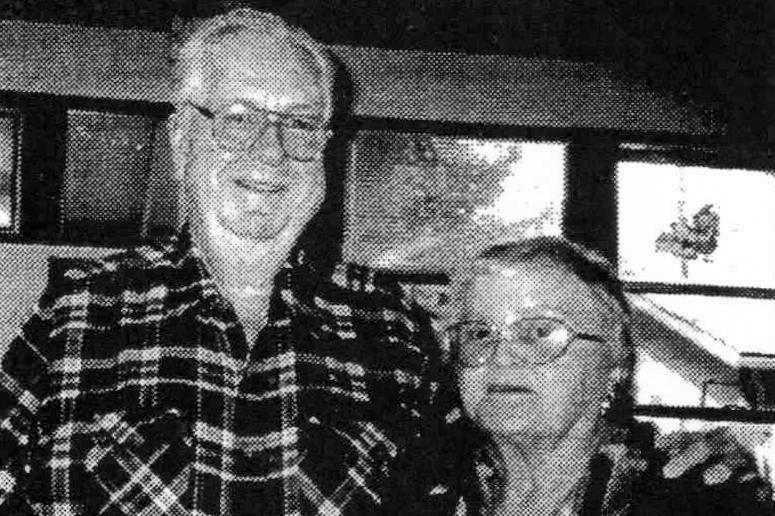 Dale Sandhei said he thought they had it better than a lot of people at that time—they had a sewer system, pumped in water, electricity, and the coal was delivered to their homes. Neely Mansion in Auburn is high on Palmer’s list of favorite local landmarks. 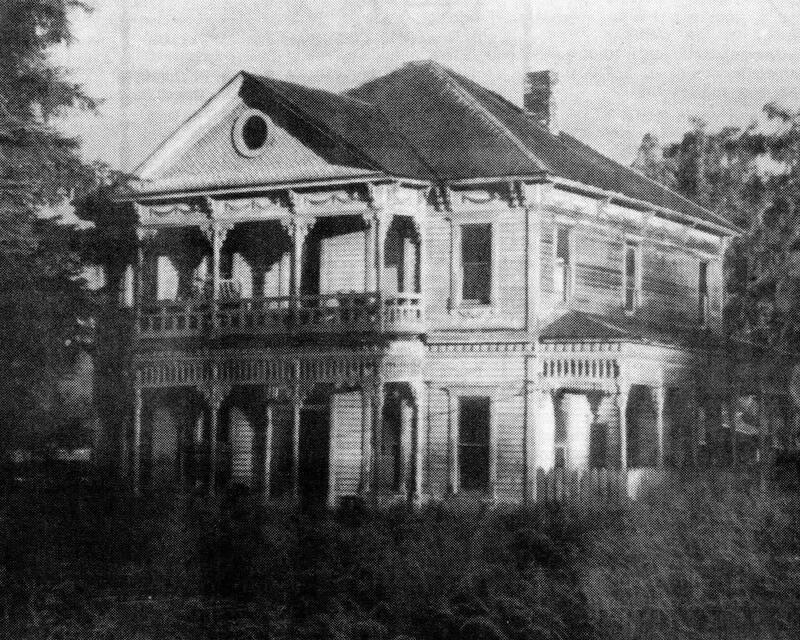 “Every time an old house goes, a part of me goes with it,” says Dan Palmer, shuffling through a stack of photographs of historic landmarks scattered over the Valley. “I can take it when nature takes them, but when it’s the bulldozers…,” Palmer’s voice softens in regret. Tough old coal-mining towns like Black Diamond always have had their share of characters, but the “Flying Frog” is one of Carl Steiert’s favorites. 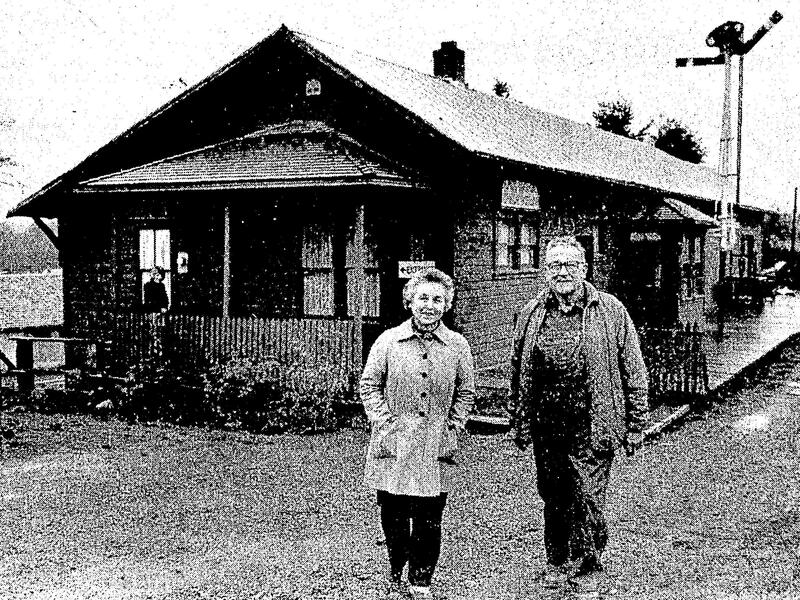 Now that there is a place to store all the memorabilia of Black Diamond, members of the Black Diamond Historical Society are busy working on an addition to the former railroad depot, applying for grants and taping the memoirs of the old timers. 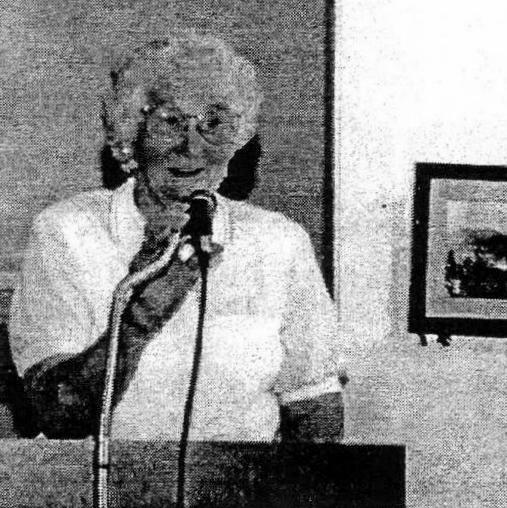 Eva Litras fondly tells that five generations of her family have grown up in the Selleck area. Butcher went to all the first eight grades in Selleck and said it was the best place in the world to grow up. When you tell someone you’re from Hobart, “Where is Hobart?” they ask. 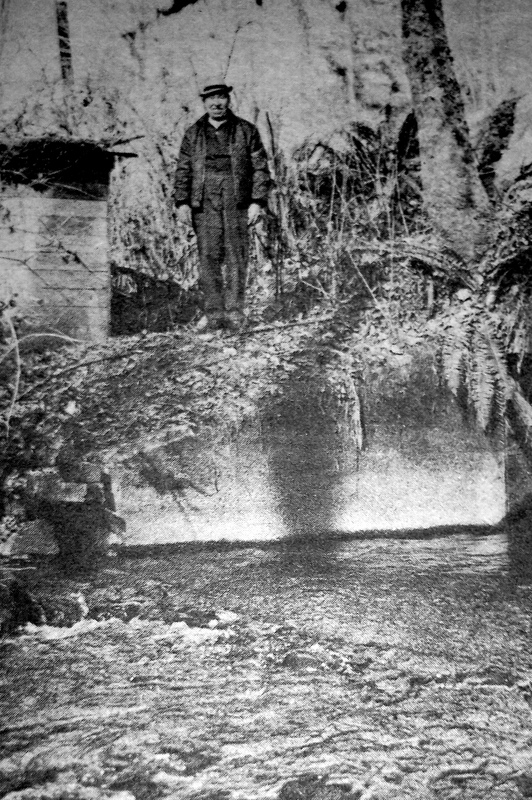 It is at the headwaters of Issaquah Creek, the two forks known to us old stump jumpers by the following names—north fork as Holder’s Creek, east fork as Carry’s Creek. It’s part of Cedar River Valley, nestled in the foothills of the Cascades with an eastern view of the Stampede Pass area and Mount Rainier to the south. Once a sawmill town and farming area with self-sustaining farms and part-time stump farmers it was a paradise, a boy’s dream. 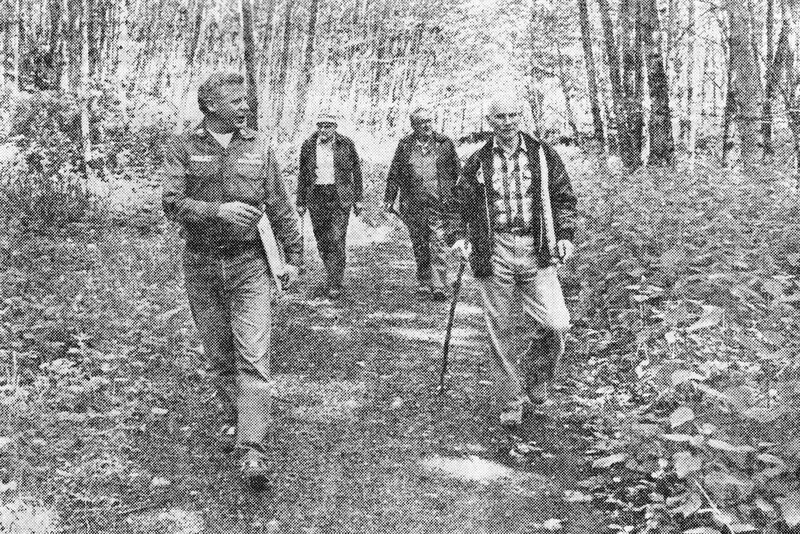 Our mountains—Tiger, Taylor, and Sherwood were covered with the forest primeval, a cathedral of the Gods, an emerald jewel that God dropped in the right location, only a three-to-four mile area. Near the summit of Sherwood is a beautiful spring two to three feet across, a trickle of the most beautiful blue water you could lay your eyes on running out of it—cold, refreshing, and thirst quenching. Huge moonshine plant seized by U.S. agents: Building housing the largest distillery plant ever seized in the state was burned by federal officers yesterday on a ranch midway between Auburn and Enumclaw. The distillery was so constructed, with its many vats, pipes, and oil burner, that it couldn’t be dismantled without destroying the building it was in. 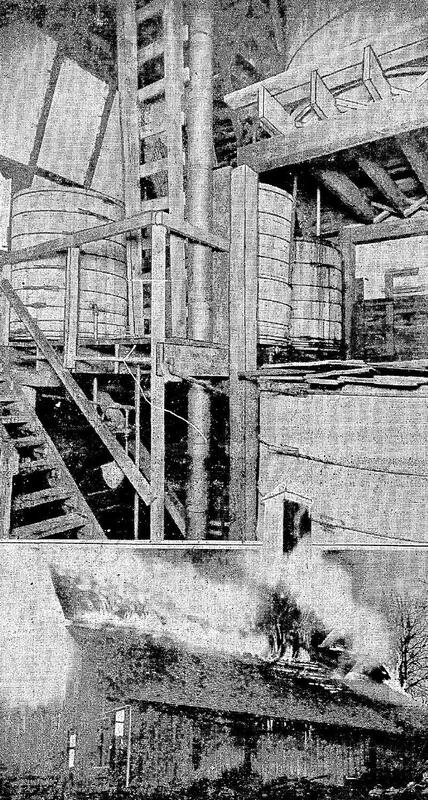 The upper photograph shows an interior corner and four vats which held various kinds of mash for the 800-gallon cooker or still. The lower one shows the building in flames. After an ambush of many hours and a spectacular raid in which nearly a score of shots were fired, federal prohibition agents sent up in smoke yesterday, in a secluded valley about three miles from Black Diamond, a distillery, which, they believe, has been one of the largest sources of moonshine in the Northwest. The distillery, complete from top to bottom, and boasting an oil burner, occupied an entire building—a former combination barn and hop kiln—and had, it is estimated, a capacity to produce from its several vats and its 800-gallon cooker, or still, about 150 gallons a day, which would bring its daily net earnings, considering the bootleggers’ quoted wholesale price, to approximately $900.